Do you think having a backyard pond and water gardening is out of the question in your back yard? Truth is, no matter how limited the space, a pond allows anyone to enjoy the sound of water, waterliles, a fountain and other aquatic features. A friend of mine really prefers waterlilies to all other plants. His problem was he lived in a townhouse with a backyard of only brick pavers. The pond design he came up with for “ponds” was using barrels. After securing a number of barrels (they were easier to find a few years ago), he cut them to the desired depth and placed them side by side on this brick patio. The “ponds” or tubs provided a place for his waterlilies. By the luscious water garden plants he grown in them, one could see that water gardening was a success with him. This experience points to the old axiom, “where there is a will there is a way.” And it indicates that waterlilies are easy to grow. The backyard location is the first consideration for any pond or waterlily pool. Ponds are at their best in the center of a garden or at the end of a vista down a garden walk or broad lawn. Waterlilies need plenty of sunshine. While it is all right to have a tree in the vicinity of a pool, one that sheds leaves heavily may clutter the pond with decaying debris, clog filters and pumps and shade sun-loving plants. A sunken tub or barrel is the simplest and least expensive of all “water garden ponds”; anything smaller is impractical. For this, a beer or wine barrel is ideal and should last many years. Saw it in half, as the entire barrel would be too deep for lilies. The depth should be between 18 and 24 inches. It is advisable to line the barrel with a heavy plastic or burn out the interior of the cask to prevent harmful material from getting into the water. To install this “mini” pond, dig a hole slightly larger than the tub or barrel. Next, tamp the walls of the hole firmly and place the container in position with the rim about level with the surrounding soil. Fill the space around the wall of the barrel with loose soil and tamp it with a shovel handle or your feet. If the soil is not firmed thoroughly, subsequent sinking may occur. The concrete pond is a lot of work as you’ll see below. The whole pond building process can be made much easier by starting with one of the manufactured backyard pond kits on the market today. Building back yard ponds does take work. However, it is much less costly and easier for the DIY homeowner then the concrete route. The below 3 videos cover the whole process. A concrete basin is a more ambitious project. If it is informal it may be a part of a rock garden or backyard corner; if it is formal it may be incorporated in a geometric garden plan. The simplest pattern is a square or rectangle, but one can often copy on a miniature scale artistic pools in parks and botanical gardens, or the coutours of ponds and lakes in nature. A concrete pond basin must be able to withstand winter conditions. One which has vertical walls must be constructed with wooden forms and should be strongly reinforced with iron or steel rods. The walls should be a minimum of 6 inches thick. On the other hand, backyard pond designs with sloping sides can be built without reinforcement or wooden forms. It is wise to employ a layer of heavy chicken or fencing wire within the concrete for added security, however. To make such a pool, dig a hole of any desired size or shape but with the proposed sides at about a 45 degree angle. Firm the soil in the basin evenly and thoroughly. Then lay down the first coating of cement, making it 2 1/2 inches thick and pressing it in place. The floor should be the last part to be worked upon. Cover the entire surface with wire netting and apply the second layer of concrete about 2 inches thick. It, too, must be firmly stamped down so the wire netting is really embedded in concrete. The basic mixture is one part cement, two parts sand and four parts gravel. After the double layer has become quite firm, a 1/2-inch finishing coat is applied, using a mixture of one part cement and two parts sand. A waterproofing material should either be incorporated in the concrete mix or a commercial water-proofing compound applied later. Formal ponds need coping or edging of cut stone, cement, marble slabs or hard brick laid on edge. The coping, for the sake of economy and beauty, should never stand more than 4 inches above the surrounding grade. All concrete ponds should be thoroughly washed out before planting, either by changing the water several times or by letting water stand in the pond all winter. This is called maturing the pond. Ponds of much size should be connected with the general water supply and a drain provided for easy emptying, cleaning and refilling. Drainpipes, of course, must be installed during the construction work. A small pond does not require a drain or water intake as the basin can be filled by means of a hose and the water siphoned out the same way. When the pool is ready for planting, the decision must be made between growing lilies in sunken pots or planters or in soil on the pool bottom. If a soil bottom is preferred, at least 6 inches of good soil must be provided. For large ponds, tubs or boxes holding a bushel of soil are more desirable as less soil will be required than if the entire bottom had to be filled. Then too, with containers the pond can be kept cleaner more easily. Depending upon the type of lily, the depth of the water above the box or tub may range from 6 to 12 inches. 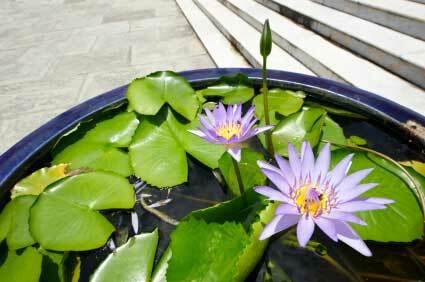 It is best to provide a separate container for each water lily. As far back in the annals of man as it is possible to probe, ponds, pools and water gardens have played an important role. Judging by the ancient paintings uncovered in tombs and temples, water plants were cultivated for their medicinal and food value, as well as for ornamental purposes. Modern water gardening, however, seems to go back to the latter part of the 18th century when Nymphaea odorata, a native American waterlily, was introduced in England. It provided the stimulus for the present water gardening trend. In 1849 the prized aquatic oddity, Victoria regia, bloomed, for the first time outside of its habitat, in the aquatic ponds of the Duke of Devonshire and the craze for waterlilies began. Brilliant men, both botanists and horticulturists, began serious study in this fascinating new field. New species were introduced and described and, eventually, new varieties were developed by hybridization. Rory Latour-Marliac, a Frenchman, astonished the world by creating outstanding hybrids of hardy waterlilies. Today these crosses remain, after more than a century, the most sought-after prizes for ponds and pools. To Monsieur Marliac we must give credit for imparting the impetus to water gardening that made it widespread and permanent. The Dilemma of Small Landscapes And Water?